Version 2.1.0 introduces some major changes to the way the Languages are stored. Previously there was a TextAsset for every Language. But given that unity keeps in memory all the referenced TextAssets, it was consuming more memory than needed. Every TextAsset had the terms name, type and description so all those were duplicated in memory. Now everything goes inside the LanguageSource Object/Prefab. Also it is set to allow automatic compression/decompression of the unused translations on a next version. For the project to work after upgrading the plugin from a pre 2.1.0 version into a 2.1.0, you will need to do a couple steps. 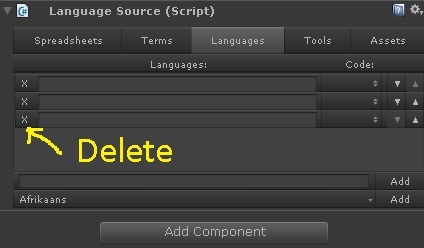 4- Find the TextAssets you were using to store the languages and drag them into the "Add Language" section.